Missouri Republicans continue touring the state today to rally voters, days before the election, but without their candidate in one of the key races. 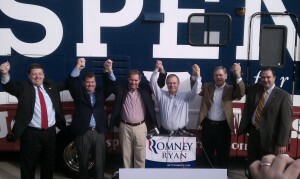 Todd Akin is not a part of the “Comeback Team” bus tour. 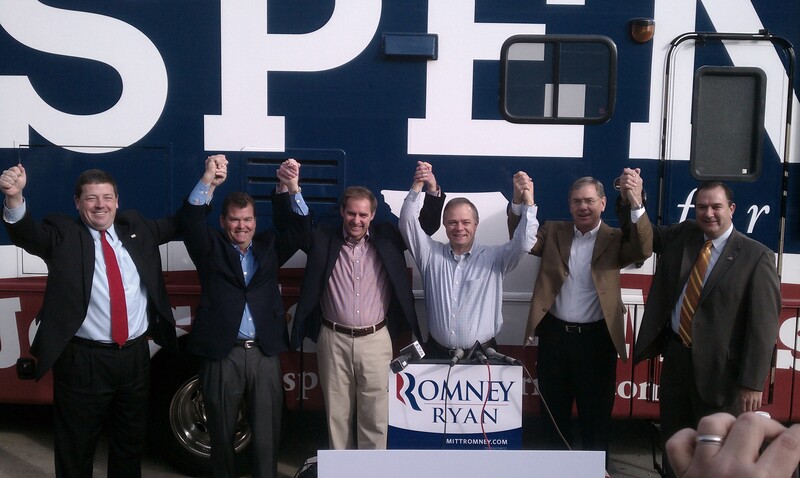 On the Republican “Comeback Team” tour stop at Jefferson City, the GOP’s candidates (from left to right) for attorney general – Ed Martin, for governor – Dave Spence, for treasurer – Cole McNary and for secretary of state – Shane Schoeller are joined by Congressman Blaine Luetkemeyer and state Senator Mike Kehoe. Executive Director Lloyd Smith urges Republicans to support Akin. “Todd Akin is coming up and going to win the U.S. Senate Race here in Missouri.” A Republican party spokesman said Akin was unable to join the bus tour because of scheduling conflicts. Many Republicans have distanced themselves from Akin since an August interview, when he said a doctor had told him that a woman’s body can prevent a pregnancy when she is raped. Others in the party have remained supportive, or backed off their criticism.